Mountain disc golf combines plenty of wonderful components: hiking, mountains, friends, beer, and throwing things. 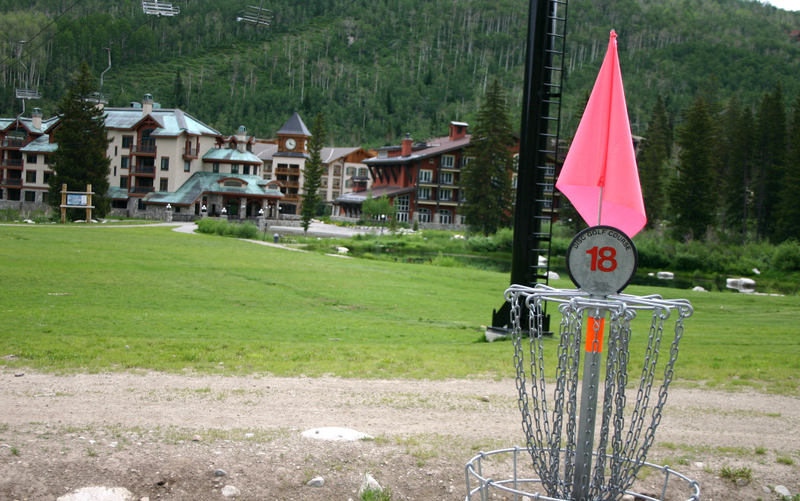 Unlike regular disc golf, the courses are up in the mountains, usually on the slopes of a ski resort. When winter snow melts out, the summer disc baskets are put in, and the fun begins. In case you’re not familiar, disc golf works much like regular golf, with fewer polo shirts and more running around the woods. You hike or get a lift ride to the start of the course, and tee off by throwing a special Frisbee-type disc in the general direction of the pole-mounted basket. There’s a par number for every hole, and you’ll generally find either nine-hole or 18-hole courses. Disc manufacturers make every sort of disc under the sun: distance drivers, mid-range discs, and short/approach putters. They’re reasonably inexpensive, which comes in handy because the dense forests tend to gobble the discs up. 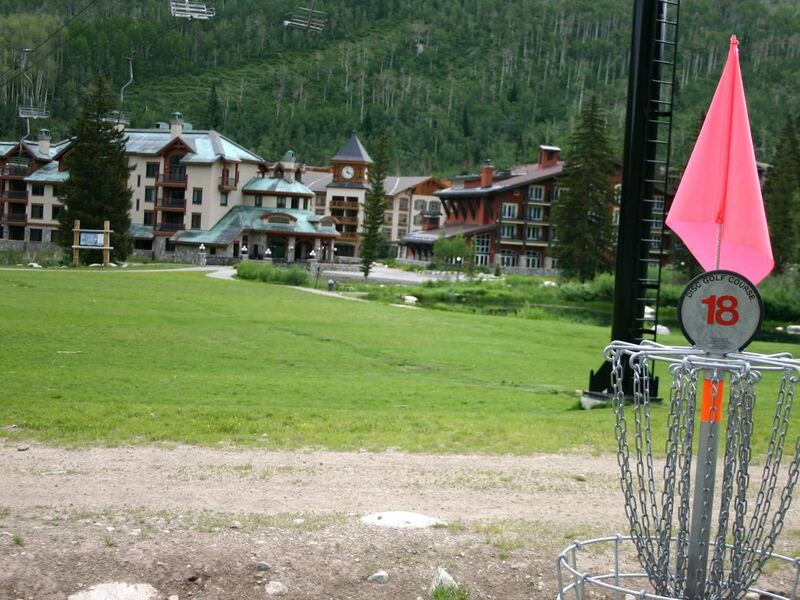 As more ski resorts explore ways to draw visitors during summer, mountain disc golf courses are sprouting up around Utah. Once people give it a try, they’re generally hooked, whether they take it seriously or not. You don’t have to be a pro to enjoy throwing discs in the woods with friends, after all. Sure, there’s some technique to it, and if you’re the competitive type, you’ll geek out on studying all the different types of throws. Or, you can just chuck it. To get to the course, drive to the Solitude village (the second entrance to the resort) up Big Cottonwood Canyon. The friendly folks in the front-desk office can get you outfitted. You can rent two mid-range discs for $21. Using the course itself is free; hole one is at the top of the Sunrise lift. The hike to the top of the lift is a brisk 45-minute walk up the resort’s summer service roads. If you decide to snag a chairlift ride, it’ll cost $10, and keep in mind that the lift only runs Friday-Sundays in the summer. The course zig-zags across and down the front side of the mountain; each hole is officially par three. 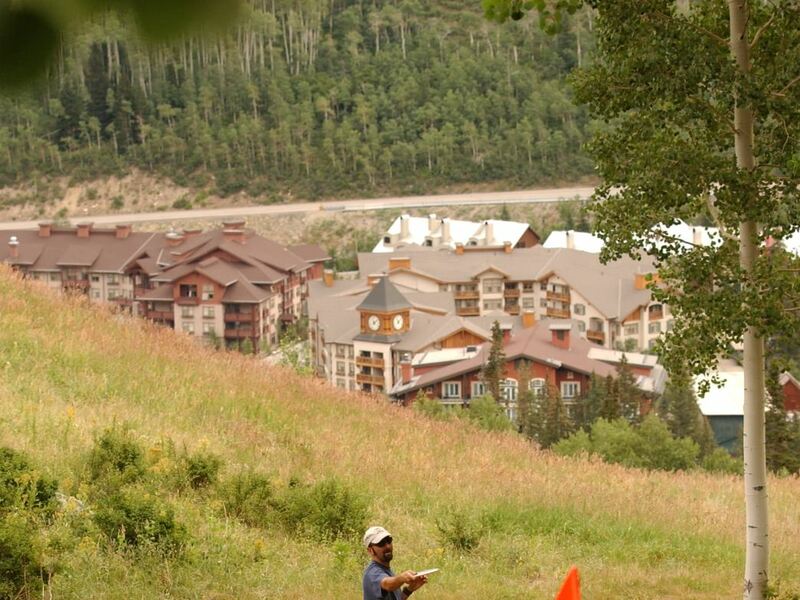 You’ll work through dense aspen groves and evergreens, wildflower meadows, and streams, and top it all off with the epically long Hole 18 shot down the Main Street ski run. This hole tees off at the top of the ski run, with a generous view of the village and pond below. It covers a whopping 1,200 feet from top to basket, dropping 400 vertical feet along the way. This run is tree-free, but somehow it can be impossible to locate where your disc landed among the wildflower bushes. Never mind; this is a beersy, grown-up version of an Easter egg hunt. You’ll love it. 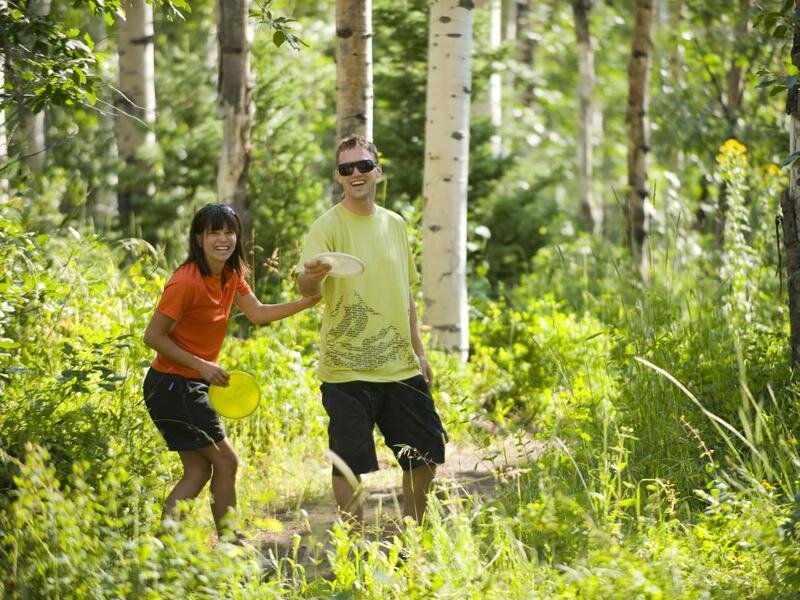 The Canyons, on the Park City side of the ridge opposite Solitude, offers an excellent disc golf experience as well—and you can grab a bite or drink in Park City after for a cool-air evening. Like Solitude, use of the course is free, but you’ll likely want to pony up for a gondola ticket ($20) to get to the top of it. They’ll rent you three discs for $16 (plus a $10 deposit), and they include a driver, mid-range, and putter disc. They’ll give you a map/scorecard and send you right on your way. The course is hilly and a little less densely wooded than Solitude’s, which can make for a (slightly) easier time finding your discs. It’s also a full 18 holes, so you can spend a good chunk of your day tromping around. Each hole is a par-three here as well, with holes ranging from 230 feet to 560 feet. The Canyons has a lively summer scene, with a farmer’s market every Wednesday and free concerts most Saturday nights. Time your disc golf just right and roll into Hole 18 just in time for live music, food tents, and draft beers. The spectacularly pretty Snowbasin resort lies an hour north of Salt Lake, and lately it's been upping its summer game. Its disc golf course is mellower than its southerly cousins: It’s just nine holes, all walkable from the base area, so there’s no need to go for a long hike or lift ride. You’ll just park at the main village and stroll in to the Grizzly Center rental shop. (only open weekends in summer.) They’ll rent you a driver, mid-range, and putter disc for $10, and playing the course is free. The course is nothing wild; you won’t be summiting any peaks, fording streams, or climbing many trees, but it’s a great, family-friendly place to practice. A bonus: Snowbasin hosts free Sunday afternoon concerts all summer long. So bring a camp chair and an appetite for music and barbequed delights.